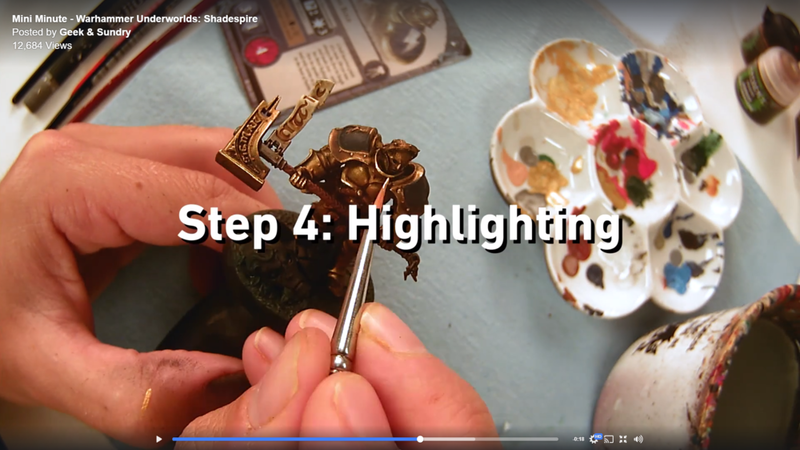 Nothing in my life was more rewarding then teaching miniature painting to my classes in Monterey and Santa Cruz, California, and private lessons here in my recent move to San Diego. Regular Sunday class at Mythic Games, Monterey, CA. Miniature painting was not something in which I was born gifted. In fact, here's a crazy story: when I first walked into a game store in Newark, Delaware (where I am from, originally) and saw the rack of Games Workshop miniatures, and opened my first White Dwarf, I actually saw the paintjobs in a very unusual light. I didn't think they were painted, they looked so contrasty and 3D that I genuinely thought they were made out of Sculpey clay. So one day I asked my mom to take me to A.C. Moore (or a Hobby Lobby, or Michael's for those who don't know A.C. Moore) and I picked up about $30 of Sculpey clay. I kneaded and snaked my way to horrible abominations and terrible acts of creation-turned-wrong. So when the oven door opened, and I pulled out my cookie sheet to googly-eyed monstrosities, I realized I may have had this whole thing wrong. Turns out, minis aren't made of Sculpey clay. That's when I got a chance to visit my first Games Workshop flagship store. My mom was going shoe shopping (Franklin Mills is a big mall for relatively poor people), and in that mall, as we were walking past stores, I stopped dead in my tracks. I smashed my face against the window at my first Games Workshop store and one of the guys inside had to peel my face off the glass, and proceed to wipe my drool away. Think: sucker fish. I was hooked. I was more then hooked. I became obsessed. I became obsessed with not only the idea of figuring out how those painters that painted the display miniatures in that store made the magic happen, but I was obsessed in making that magic happen for myself, no matter WHAT. So I stumbled into the shop with a dazed, zombie-like gait and asked the poor salesperson about ten thousand questions about paint, brushes, assembly, glue, hell I even asked him if he would teach me, and that I would offer him my Wolverine issue #2 comic book (my prized possession) in exchange, which went over comically considering the salesperson was just some kid trying to pay his way through college and never touched a paintbrush before in his life. But he was tempted to say yes, because... I mean c'mon... Wolverine issue #2. My mom, God rest her soul, saw the fire in my eyes and though we didn't have a lot of money at the time, let me buy over $100 worth of stuff. And the ride home was quiet, deadly quiet. I exhibited the intense focus of a crackfiend hoarding over all my ill-gotten gain as we drove home. Before the car even got into the driveway my door was open and I was off, racing for the door. "That looks like a Hollywood set. You are incredible! You need to make things for movies!" One student's private lesson. This was painted from start-to-finish in 2 hours after 1 lesson. And from that point on, I worked and worked and worked and read everything I could. At this time, there was no YouTube, so I didn't have any online guidance at all, it was just listening to people at my local game store, and reading White Dwarf. Now I could continue to tell my story, but that is a different article. Here I am, in "Hollywood", painting "Hollywood" sets and miniatures, and even featured as a media personality and 'master painter' for a painting show at Geek & Sundry. I worked on puppets seen on Comedy Central. And the only damn thing I can say as to how that all came to fruition is that you need to persist even when you are bad at something. 10 of my miniatures were featured in the Best of the World Coolminiornot.com annual hardcover over back-to-back years. Do NOT stop. Lean into failure, and keep trucking, keep pushing, and seek mentors. Teaching is simply my way to pass the torch of my internal fire to the next person. Teaching is my way to watch others find that passion that I found. Teaching is watching children finding a lifelong hobby that saved my life both emotionally, and financially more times then I can count. Painting is everything to me. It is the symbol of health, of self-care, of financial stability during hard times, and in sharing and building community. Never stop, and some day you will look at a figure you just finished painting, and you will realize that you are now a master painter. It's just like that.